Some good news from the UK (actually, it's the law of England and Wales that this case is relevant to). I reported this story today on NAM's website, aidsmap.com. The case against an HIV-positive man charged with grievous bodily harm for allegedly ‘recklessly’ sexually transmitting HIV was dismissed at Manchester Crown Court last Thursday following legal argument. A 39 year-old man had been charged under Section 20 of the Offences against the Person Act 1861 (OAPA) – recklessly causing serious bodily harm – last September. An application for bail had been refused on the grounds that there was a risk other offences could be committed; consequently, the man had been in custody since his arrest. 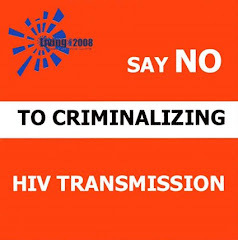 The complainant was a 37-year-old woman who tested HIV-positive in September 2007, after the accused man had provided her name to clinic staff for contact tracing purposes. In his application to dismiss the case, defence barrister, Alan Walmsley, noted that since this was her first-ever HIV antibody test, and since the complainant had admitted to at least five sexual partners in the twelve months before her diagnosis, the evidence was insufficient for a jury to be able to convict. “I suspect the defendant probably infected the complainant,” he noted, “but that is a long way short of what the prosecution need to prove." According to a report in today’s Manchester Evening News, Judge Rudland freed the defendant with these words: "You are still HIV-positive. You still have clear obligations [to those] with whom you have sexual relations. You are still likely to be a defendant in criminal proceedings if you do not behave. Do you understand?" The man answered that he did, and then left the court a free man. This is the third time that a lack of evidence in an English prosecution for HIV transmission has resulted in the defendant being cleared. In August 2006, a gay man was acquitted of 'reckless' HIV transmission at Kingston Crown Court, following evidence that phylogenetic analysis could not definitely prove that the defendant infected the complainant. In February 2007, in a case that went unreported at the time, a Preston Crown Court judge dismissed a 'reckless' HIV transmission charge against a gay man due to the fact that other sexual partners of the complainant – who may have been the source of his infection – did not agree to have blood samples taken for HIV testing or phylogenetic analysis.